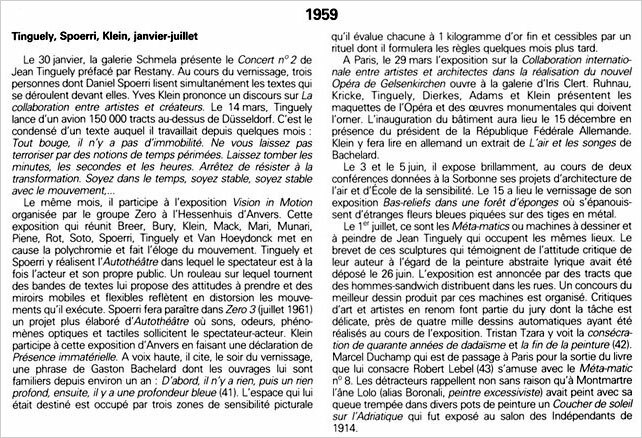 Robert BREER, Pol BURY, Yves KLEIN, Heinz MACK, Enzo MARI, Bruno MUNARI, MECKER, Dieter Rot, Jesus Raphael SOTO, Daniel SPOERRI, Jean TINGUELY, Paul Van HOEYDONCK. 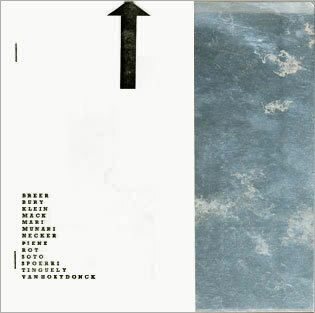 1: Exhibition catalogue. 2: Exhibition poster 3: Invite card. Unpaginated. 2 pages, intoduction in Dutch and French by Marc Cammewaert, curator of the show. Loose sheet with text in French by Jean Séaux; 2 pages, text in French by Bathazar on Bury. Participating artists: Breer, Bury, Klein, Mack, Mari, Munari, Mecker, Rot, Soto, Spoerri, Tinguely, Van Hoeydonck. Contributions to the catalogue by: W. Emmet, H. Mack, O. Piene, Bury, D. Rot, J. Tinguely, P. Van Hoeydonck. H. Mack: a sheet of aluminated paper (front cover) and 2 b/w reproductions of works and a text in German, French, English "The Dynamic Structure of Colour and Light; O. Piene: text in German, French, English and 1 reproduction of the work "reines Licht" (Pure Light); P. Bury: 2 lacerated blank plates; D. Rot: "Carré dépliable" (Unfoldable Square), originally published in #2 of the Spoerri's artist magazine "Material"; E. Williams: "Progression", folding sheet, poem to be published in the forthcoming issue #3 of "Material"; P. Van Hoeydonck: a text by Maurits Blicke. J. Tinguely's contribution is the reproduction of his manifesto "Für Statik" (For Statics) he had dropped, just a week before the openinhg of this show (March 14th), from an airplane on Düsseldorf, Germany. Paper covers (half-sized front cover, showing the aluminated plate by Mack), stapled. Condition: Fine, but the spine is broken on half of the height. Black and red letterpress print. Condition: Fine, never folded nor rolled; paper shows some undulating. Published by Hessenhuis, Antwerp, Belgium, 1959. Exhibition organized by Pol Bury, Paul van Hoeydonck, Jean Tinguely and Daniel Spoerri at Hessenhuis in Antwerpen, Belgium, March 21 - May 3, 1959, giving for the first time an international audiance to Zerro. Very early and rare documents on the Zero Group and Nouveau Realisme. We are interested in purchasing this catalogue, the poster and the invitation card. Also, in the works of art by the participating artists in this show/event. Nous sommes intéressés par l'achat de ce catalogue, de l'affiche et de l'invitation. Aussi, par les oeuvres des artistes ayant participé à cette exposition/évènement.